The most exciting vacation I've had in the last twenty-five years, was last year when I went to San Francisco for that training certificate for Selling Real Estate by Staging Homes. I guess it was so great for two reasons. The first reason was I was finally divorced and no longer being verbally abused. The second reason was Chinatown in San Francisco. There was something about the atmosphere there that freed me. Walking those streets made me feel like I was really finally away from the bad stuff of my marriage. Something about seeing the signs in Chinese and going into the stores and looking at all the beautiful ceramics and linens from China and eating the Chinese food just did it for me. And I would look down the alleys and small streets and imagine all sorts of romantic adventures that people could have and maybe I would have. One day I saw a beautiful Chinese woman in a short purple dress. Maybe 30. Very stylish, with, I'm sure, Italian sandals, and lots of silver jewelry. Here is my secret: I followed her for a few blocks. She finally went into the building that was between two restaurants. She looked around her before she went in. I just walked on, my heart racing. I assume she went upstairs to one of the apartments over a restaurant. Was her lover up there waiting? What mysteries were part of her life? A husband somewhere else? Oh, Natalie, what am I craving? Of course, nothing at all actually happened except I learned how to stage an apartment in Manhattan for selling purposes. But walking Chinatown was the best medicine I had after the divorce. That is, until I met Gary. But more on Gary when we are together. Anyway, I was looking through my pictures and I don't think you ever saw this one. 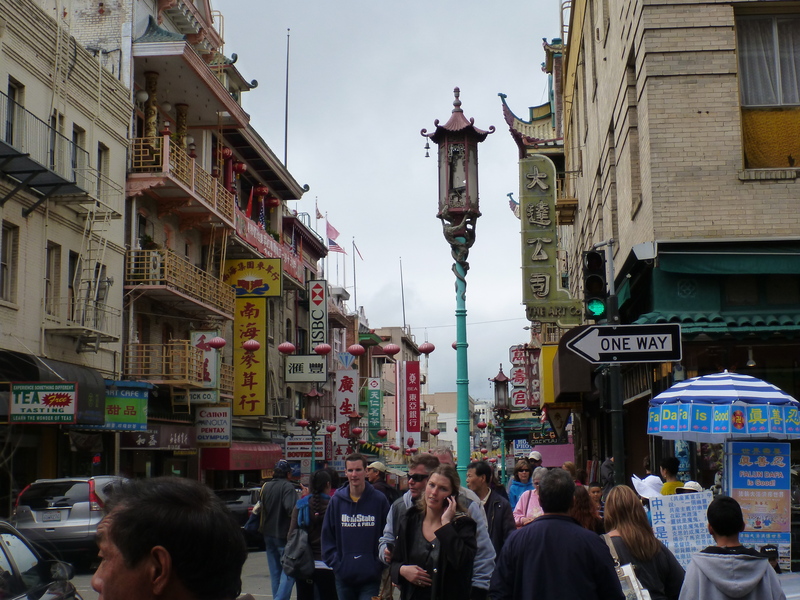 I'm not in the picture, (I took it) but it captures the feel of Chinatown in San Francisco. I wonder if Jerusalem will be as freeing emotionally as Chinatown was for me? I can't wait to find out. Your pictures of those great spices and the dark corridors in the Old City make me think it will be just as freeing. I can't wait!